I encourage you to take a look at the ratings system demo from a presentation made at the request of the TLT Group in a series they were doing on rubrics. The work originates with the Center for Teaching Learning and Technology at Washington State University. For background, see the Community Based Learning blog. The design is very attractive, and it doesn't take too long to work through the rubrics to rate a sample assignment and student work. Or you can skip to the results if you want to see the kind of assessment summaries produced. It's a fascinating project, and to me the most interesting design element is one not actually highlighted here, viz. that the plan is to be able to rate any kind of work anywhere on the Internet. The era of "enclosed garden" portfolio systems may be drawing (thankfully) to an end. Because the intent seems to be to be able to tap into crowd-sourcing for assessment (you assess some of my students, I assess some of yours, for example) I wonder if the group has considered using Amazon's Mechanical Turk service as a cost-effective way of getting ratings from "the public." This inter-rater reliability is borderline and problematic because, when extrapolated to high stakes testing, or even grades, this marginal agreement speaks disconcertingly to the coherence (or lack there of) of the program. (image by Quasimondo, licensed under a Creative Commons Attribution-Noncommercial license). How much reliability is required to be useful? That one's easy: anything better than random data can be useful (electronic stock trading programs, for example, try to ferret out very small correlations to make money on). But if we have to stand up and swear that we believe in the results for a particular student, that's a different question. So the question really turns on what we are using the data for. This is an interesting dilemma faced by administrations that try to actively use assessments of any kind. And of course the unfortunate Assessment Director will be caught in the crossfire. My contention is that too often too much faith is put in the assessments, and damage can easily result. One should not believe too much in one's convenient fictions. More on this topic later. I replied in a post and attempted to track back to here, but it does not seem to have worked. 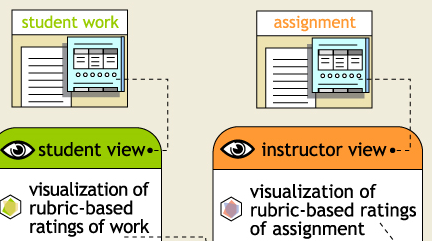 from David Eubank's 'Higher Ed (assessing the elephant)' blog where he responds to some of the Harvesting Gradebook work Nils, Theron, and Jayme presented at the July 28 TLT webinar on the creative uses of rubrics. comparing it to other crowd-source feedback systems.